I am an early riser and after taking a glass of water first thing in the morning, then it is time for breakfast which is the most important part of the day. Some people assume that skipping breakfast is a way of cutting excess fat or avoiding obesity, but that is just far from it. I often relax with a bowl of cereal with fruits or a cup of tea served with tasty pastries. Once I have had my breakfast, I am ready to kick start the day on a very pleasant tone. I detest pushing down my breakfast through my oesophagus while rushing out for work. Honestly, this isn't just part of me. This is to say that I usually wake up quite early to get my breakfast ready and waiting for me. The only task that I need to carry out is to pull the ingredients together and then all is ready for preparation. 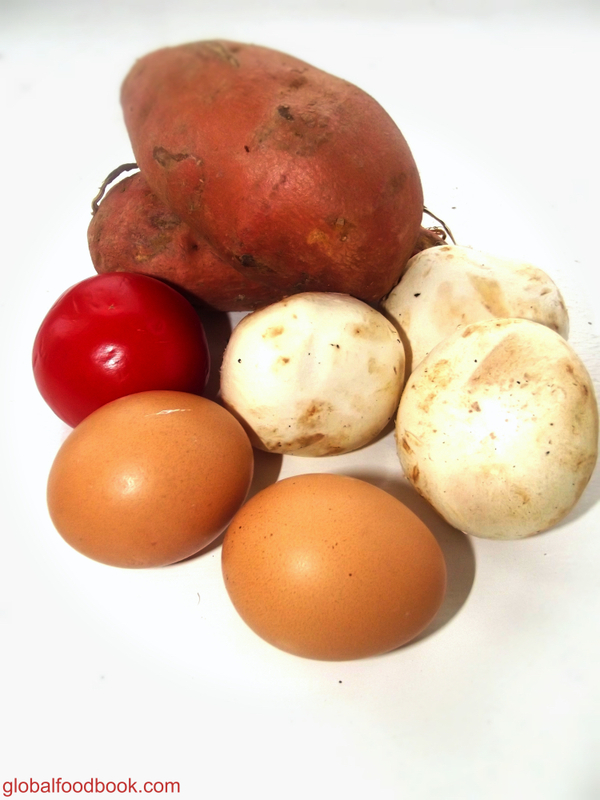 Last Sunday, I visited the farmer's market where I bought some sweet potatoes and other fresh vegetables, so this morning I thought it wise to prepare some fried Potatoes with omelette. 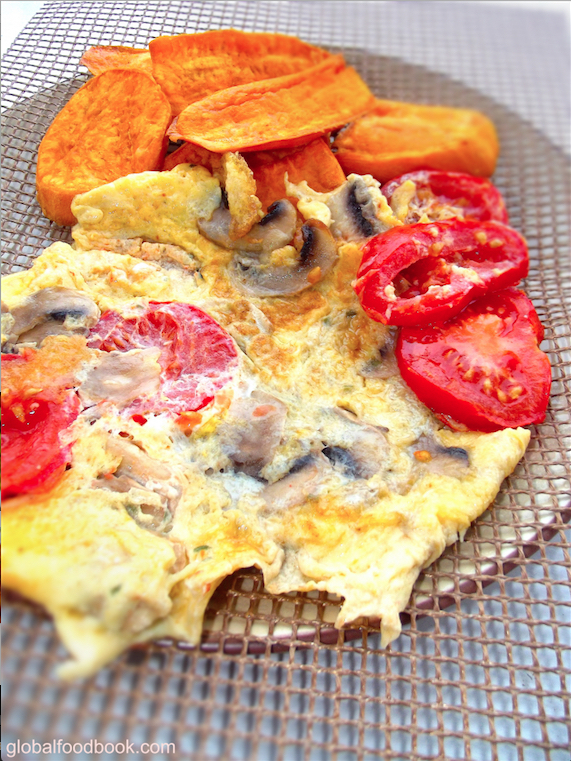 Sometimes I make my omelette plain but this time around, I decided to go with some mushrooms and fresh tomatoes. I enjoyed the outcome and taste of the dish.....YUMMY, COLORFUL & SUPER PALATABLE. Believe you me,,,,, this meal is easy to prepare and it is just a perfect way of starting the day! Slice the vegetables and set aside. Peel the sweet potatoes, wash and slice (set aside). Add vegetable oil in saucepan and heat up before adding the potatoes to fry. Fry the potatoes until golden brown and done before scooping out of oil. 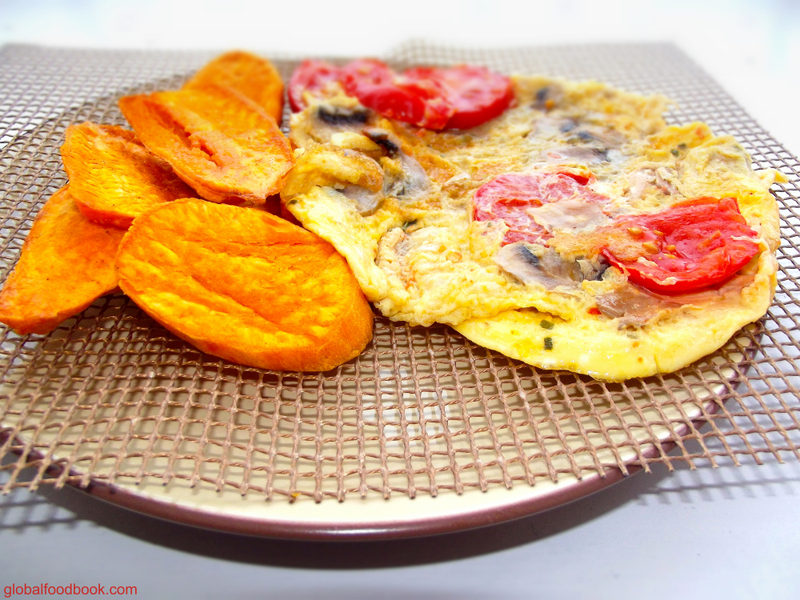 Break the eggs into a clean plate, then add salt, mushroom, pepper and tomatoes and whisk properly. Add 2 tsps. of oil in a saucepan and slightly heat up on a low heat. Pour in the mixture and allow to cook. Carefully turn over the other side of omelette to cook properly as well. Then bring down from heat and serve together with the fried potatoes. You can also serve together with a bowl of cereal or a cup of tea.